At least nine people were killed when a tour bus carrying Los Angeles-area high school students crashed in Northern California. 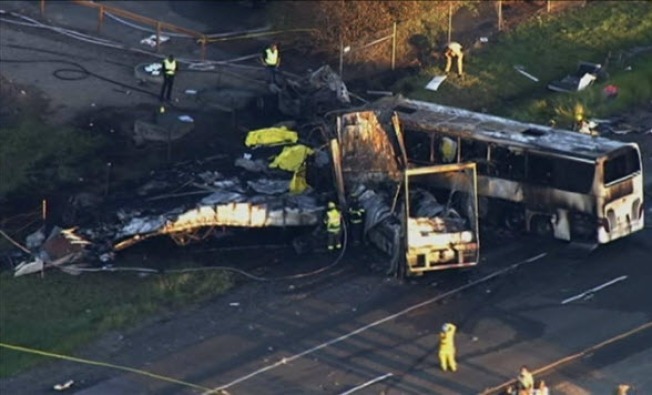 The stretch of Northern California Highway where a horrific head-on crash killed 10 people is a relatively safe stretch of road, according to documents and interviews done by the NBC4 I-team. Information from the California Highway Patrol’s Statewide Integrated Traffic Records System (SWITRS) shows there have been nine accidents in the city of Orland since 2008, but Caltrans says none of the accidents were considered serious. At least 25,000 cars and trucks pass through that stretch of Interstate 5 every day, according to CalTrans, which characterized that as very low number. In Los Angeles, stretches of highway routinely carry 300,000 to 400,000 cars and trucks per day. Because the road is sparsely travelled with a very good safety rating, state guidelines say a 60-foot wide median is all that is needed for safety. Others say that’s not enough. Attorney and Transportation Safety Advocate Katherine Harvey-Lee of the law firm Baum, Hedlund, Aristei & Goldman says the state should reconsider building a barrier in the median between the northbound and southbound lanes of I-5. NTSB: "We Won't Be Speculating About Probable Cause"
“Based on the number of deaths (in this crash) I believe the state will look at this and put a median barrier in to prevent this kind of tragedy in the future,” Harvey-Lee said. She said barriers like concrete rails -- a common sight on LA freeways -- or even cable guardrails can go a long way to stop head-on collisions. Michigan has installed hundreds of miles of the cable guardrails which state officials say can cut fatal cross-over and serious injury crashes by more than 60-percent. But an investigator who asked to remain anonymous told the NBC4 I-Team that investigators have already determined that a barrier will not be added along that stretch of highway. The investigator also said the FedEx truck was traveling 70 to 75 mph when it crashed. The speed limit in the area was reported to be 70 mph. Additionally, only rear windows opened for survivors to escape, while the front and side windows would not open despite passengers trying to break out, investigators said. Another safety issue being raised involves the use of double trailers, like the ones the FedEx truck was pulling. Safety advocates said they result in more fatal accidents than trucks towing only a single trailer. “It takes much longer to stop. It’s harder to control, and the amount of mass and force behind that vehicle is much, much greater," Harvey-Lee said. But the NBC4 I-team also found a DOT analysis that indicated while multi-trailer trucks average about a 14 percent higher fatality rate on rural interstates, the fatality rate on crowded urban freeways is actually about 9 percent lower than single-trailer trucks. NBC4's Phil Drechsler, Tena Ezzeddine and Chris Henao contributed to this report.